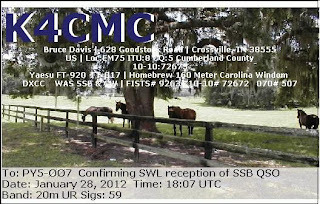 eQSL recebido: K4CMC, Crossville, TN, United States, 14 MHz, QSO w/ TO4M. 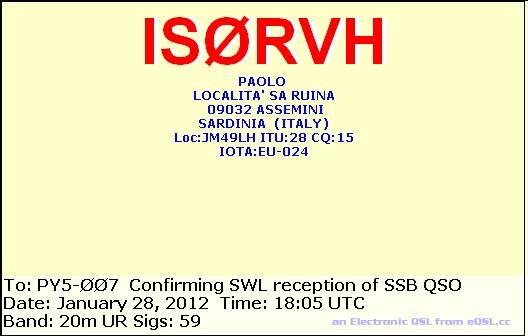 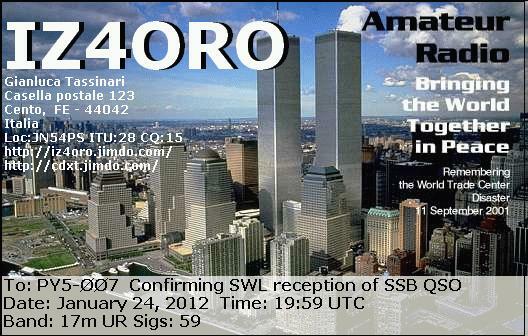 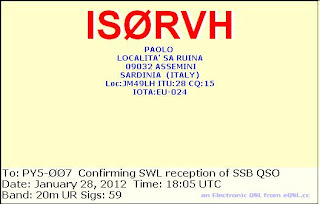 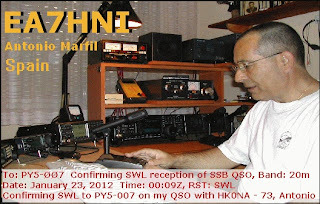 eQSL recebido: IS0RVH, Sardinia, Italy, 14 MHz, QSO w/ TO4M (Mayotte Island DX Pedition). 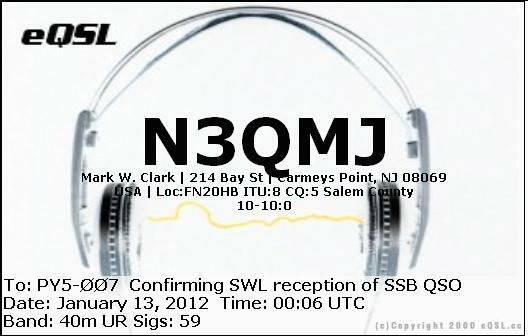 eQSL recebido: N3OMJ, Carmeys Point, NJ, United States, 7 MHz, QSO w/ PY6HD. eQSL recebido: KD0ZZ, Jonesburg, MD, United States, 21 MHz, QSO w/ VP8DNT (Falkland Islands). eQSL recebido: KZ1A, Staunton, VA, United States, 28 MHz, QSO w/ HK0NA (Malpelo Island). 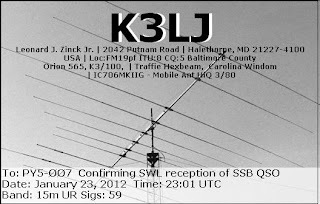 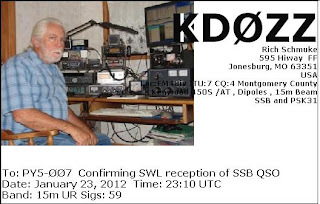 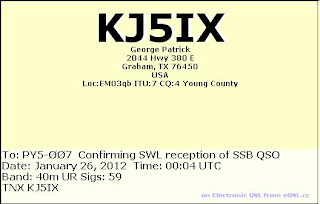 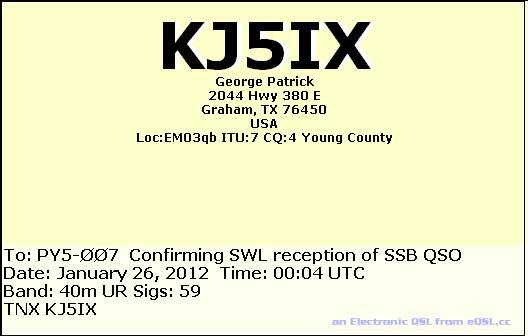 eQSL recebido: KJ5IX, Graham, TX, United States, 7 MHz, QSO w/ 9Y4LAS. 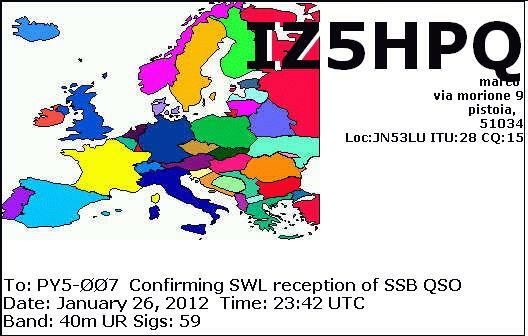 eQSL recebido: IZ5HPQ, Pistoia, Italy, 7 MHz, QSO w/ 9Y4LAS. eQSL recebido: PY1RY, Teresópolis, RJ, Brasil, 7 MHz, QSO w/ 9Y4LAS. 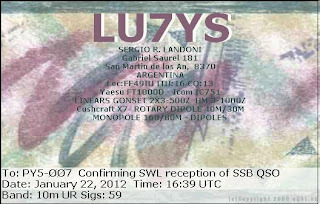 eQSL recebido: LU7YS, San Martín de los Andes, República Argentina, 28 MHz, QSO w/ KP2A. 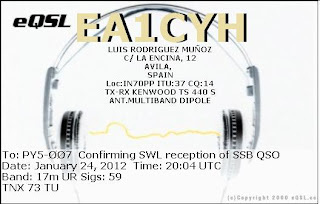 eQSL recebido: EA1CYH, Avila, Spain, 18 MHz, QSO w/ VP8DNT (Falkland Islands). 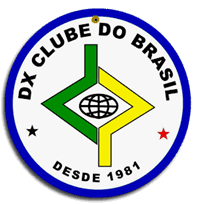 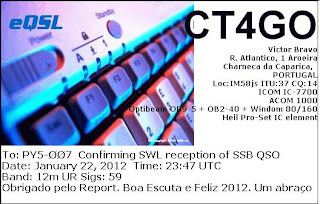 Confirmação recebida: Radio Free Asia - 11.605 kHz. 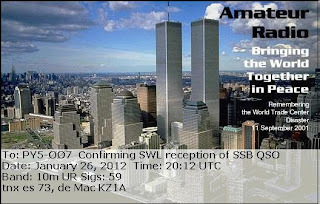 Radio Free Asia, 11.605 kHz - Relay Tanshui - TWN. 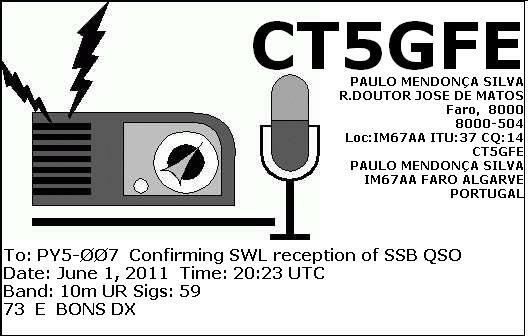 (Rx: Sony ICF SW 7600G/Ant: Longwire do Redsun RP300). eQSL recebido: YY5RTX, Caracas, Venezuela, 21 MHz, QSO w/ HK0NA (Malpelo Island). 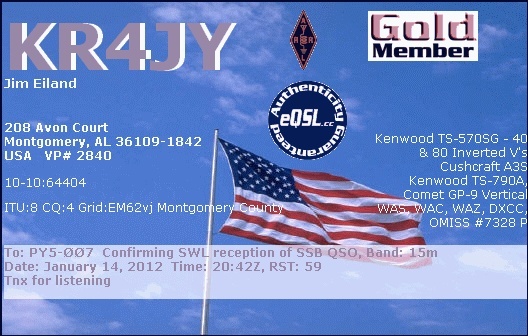 eQSL recebido: KR4JY, Montgomery, AL, United States, 21 MHz, QSO w/ 3DA0NJ. 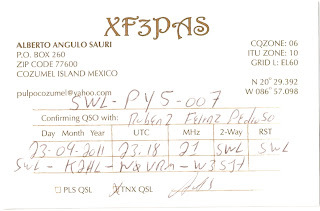 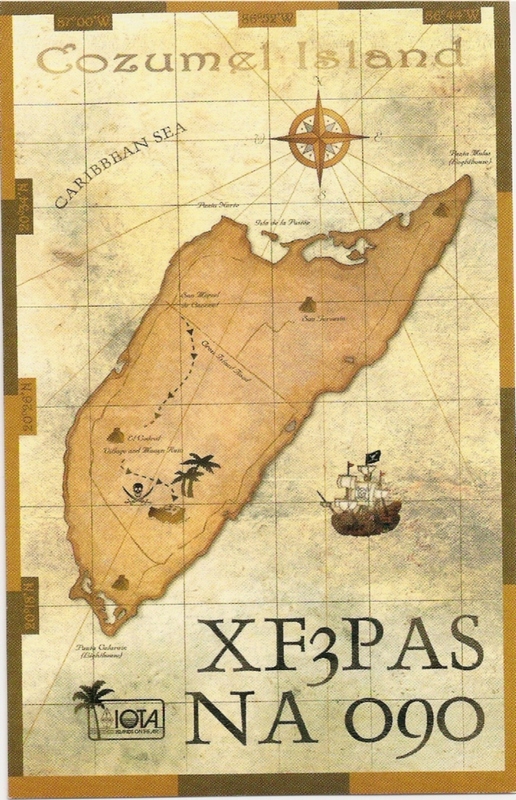 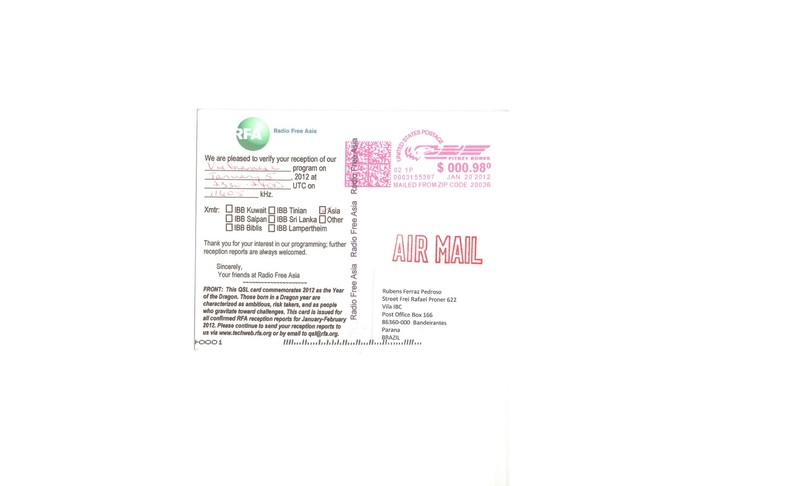 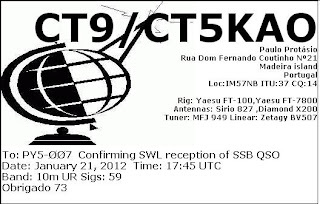 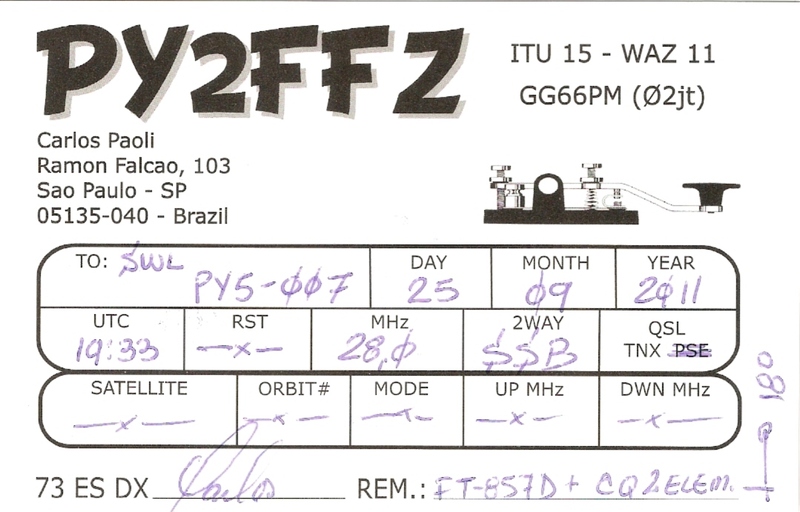 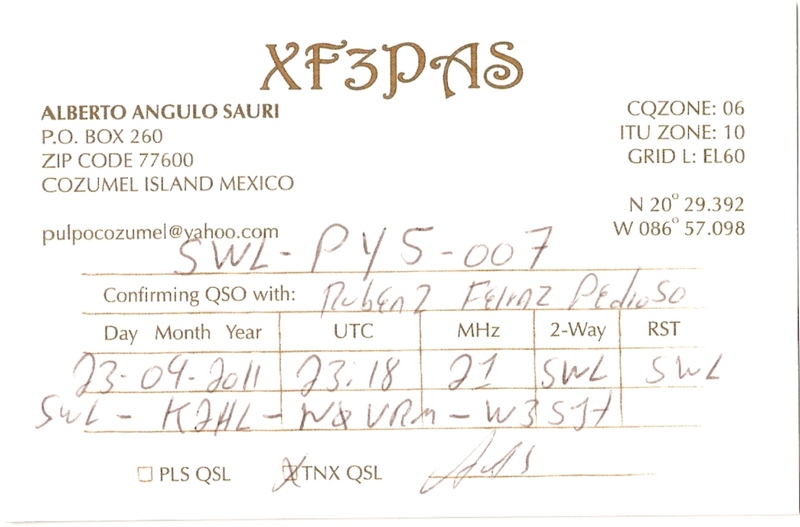 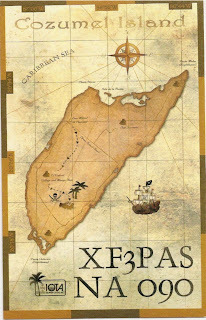 Cartão QSL recebido: XF3PAS, Cozumel Island, Mexico, 21 MHz, QSO w/K2HL, W2VRM, W3SJT, etc. 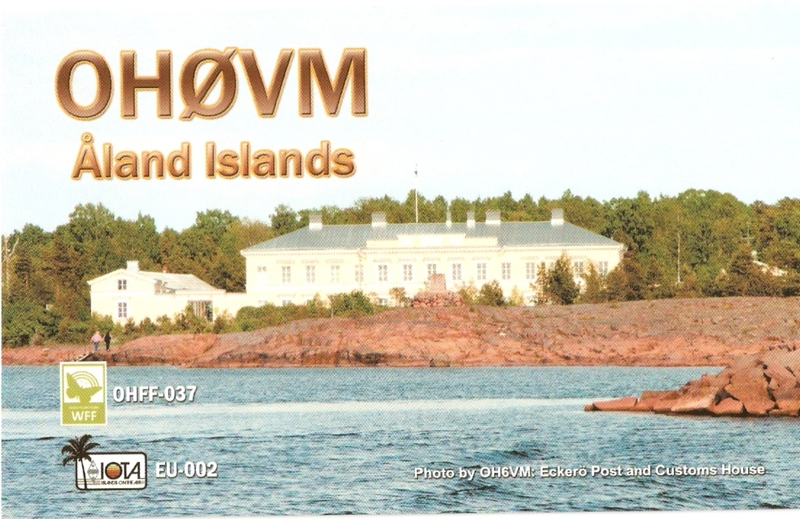 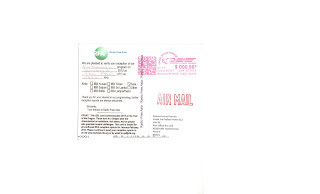 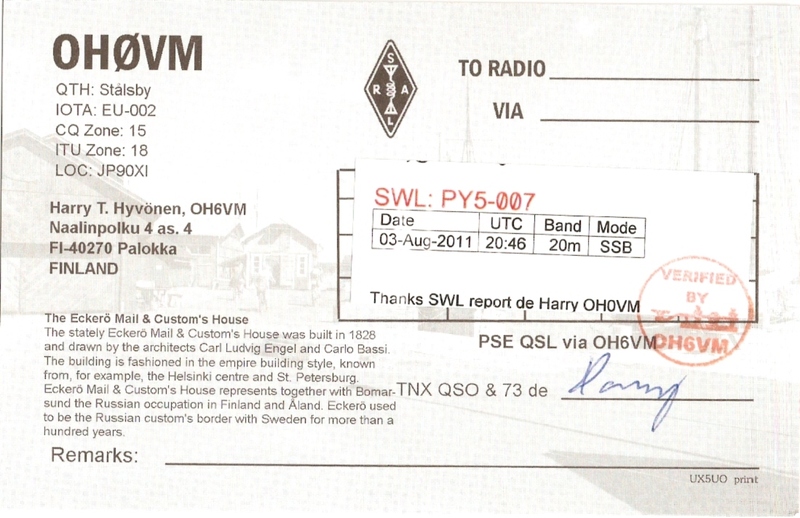 Cartão QSL recebido: OH0VM, Palokka, Aland Islands, Finland, 14 MHz, QSO w/ PY6RT. eQSL recebido: KF8GG, Monitor, OH, United States, 21 MHz, QSO w/ HK0NA (Malpelo Island). eQSL recebido: PT9ZE, Campo Grande, MS, Brasil, 28 MHz, QSO w/ HK0NA (Malpelo Island). 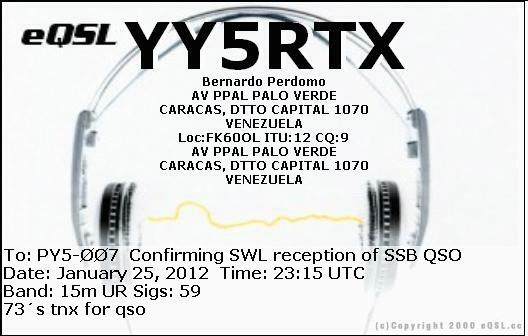 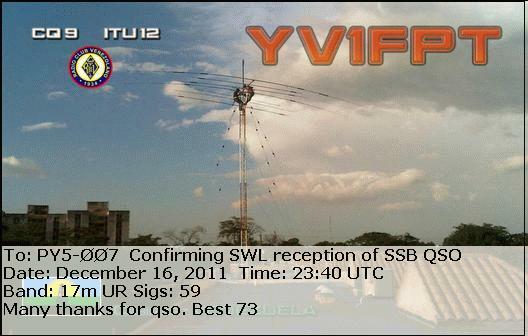 eQSL recebido: YV1FPT, Cabimas, Venezuela, 18 MHz, QSO w/ PY1DY. 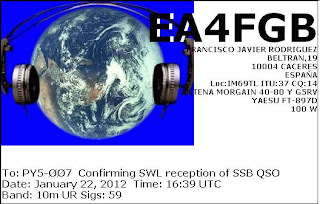 eQSL recebido: WA2VQV, Milford, DE, United States, 21 MHz, QSO w/ HK0NA (Malpelo Island). 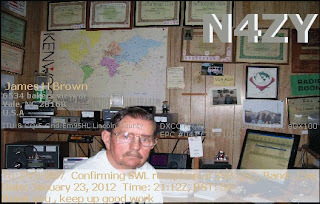 eQSL recebido: N4ZY, Vale, NC, United States, 21 MHz, QSO w/ HK0NA (Malpelo Island). 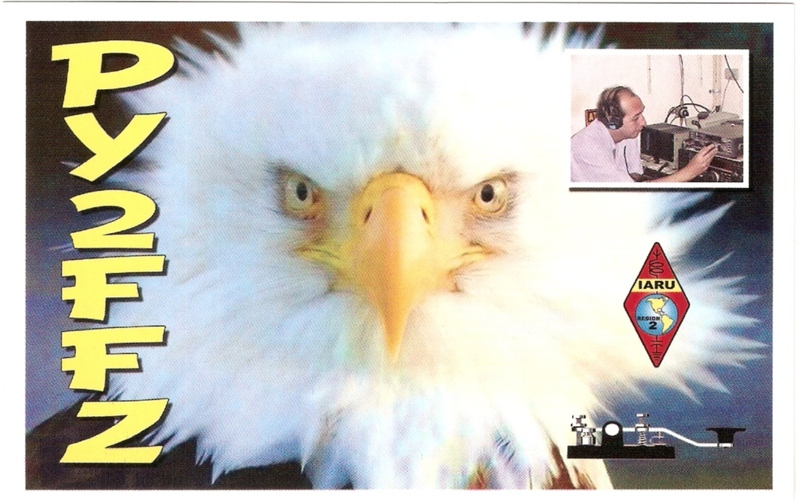 eQSL recebido: IZ4ORO, Cento - Fe - Italy, 18 MHz, QSO w/ VP8DNT (Falkland Islands). 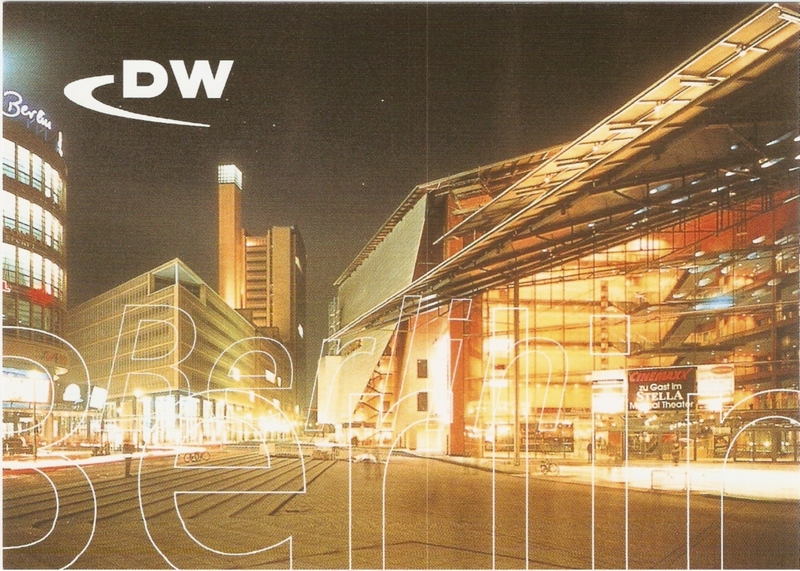 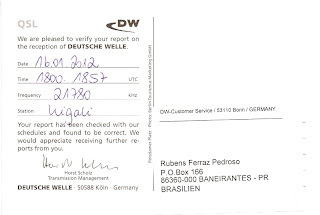 Confirmação recebida: 21.780 kHz - Deustche Welle - Alemanha. 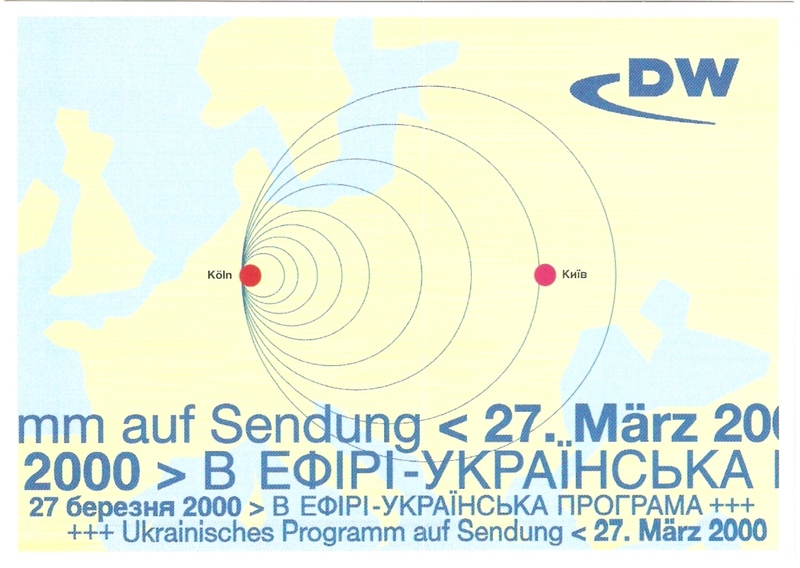 Rádio Deustche Welle, 21.780 kHz - Relay Kigali - Rwanda. 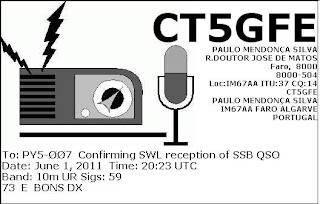 (Rx: Sony ICF SW 7600G/ Ant: Longwire do Redsun RP300). 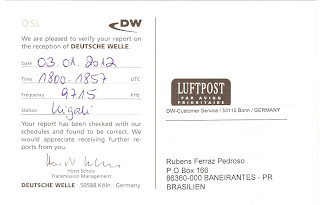 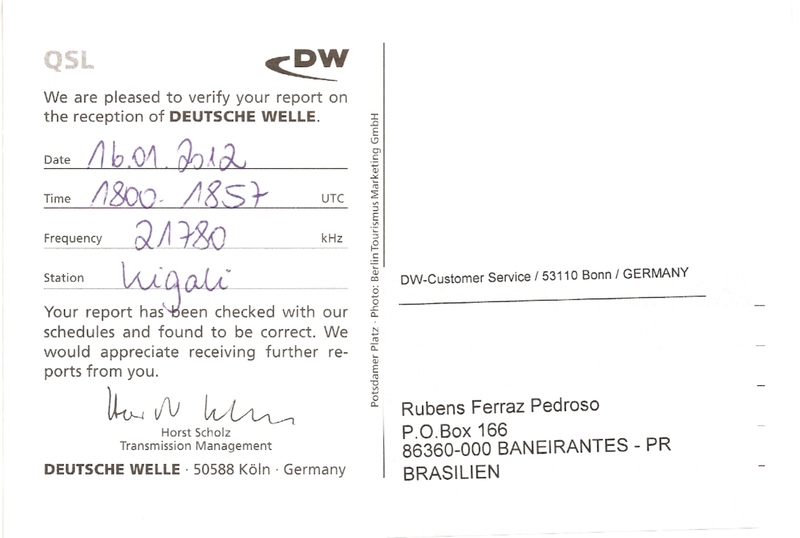 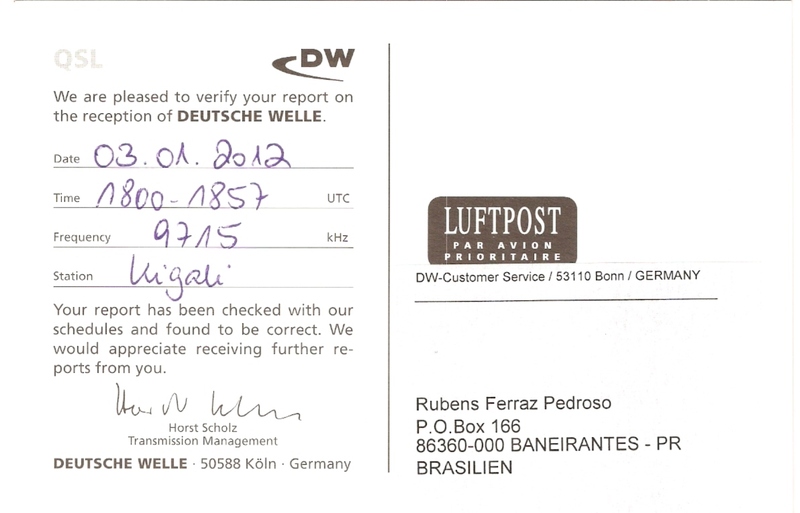 Confirmação recebida: 9.715 kHz - Deustche Welle - Alemanha. 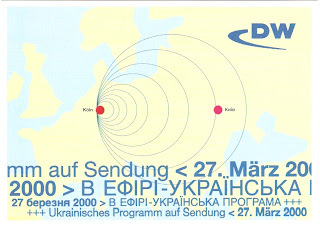 Radio: Deustche Welle, 9.715 kHz - Relay Kigali/Rwanda. 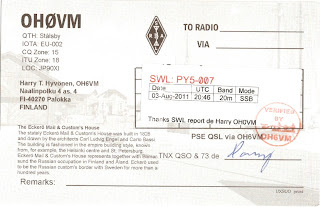 (Rx: Sony ICF SW 7600G/Ant: Sony AN71). 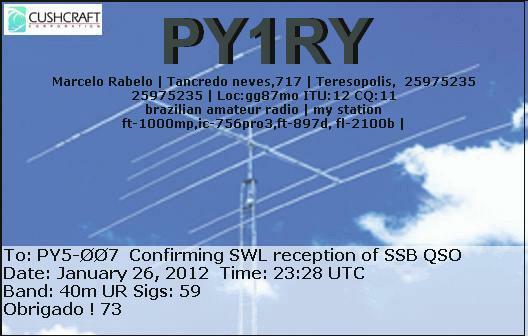 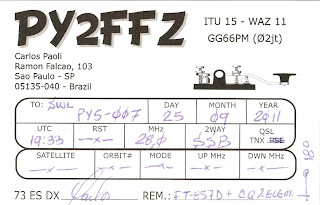 eQSL recebido: PY2FFZ, São Paulo, SP, Brasil, 28 MHz, QSO w/ LU6YCB. 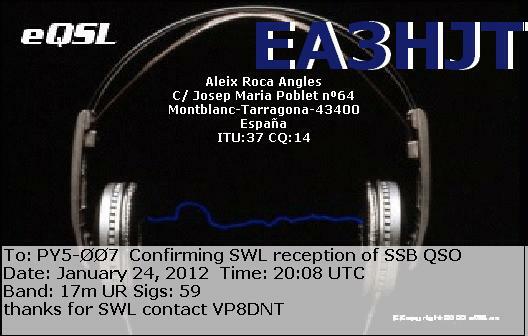 eQSL recebido: EA3HJT, Tarragona, Spain, 18 MHz, QSO w/ VP8DNT (Falkland Islands). 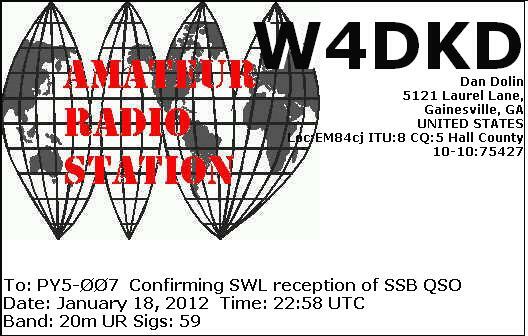 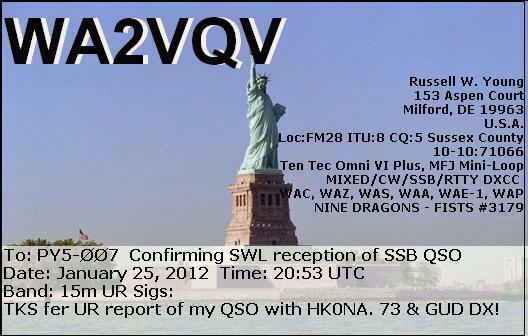 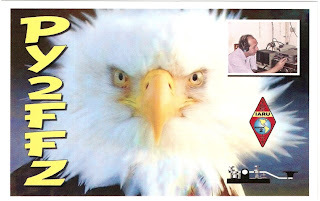 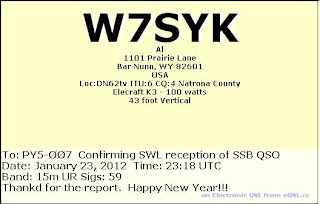 eQSL recebido: W7SYK, Bar Nunn, WY, United States, 21 MHz, QSO w/ VP8DNT (Falkland Islands). 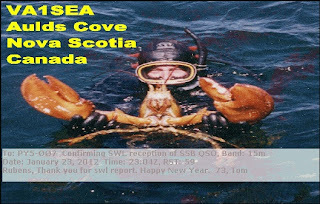 eQSL recebido: VA1SEA, Auld's Cove, Canadá, 21 MHz, QSO w/ VP8DNT (Falkland Islands). 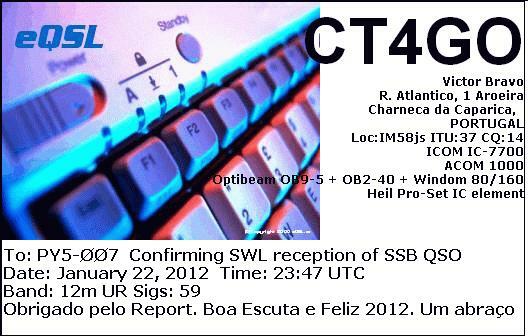 eQSL recebido: CT4GO, Charneca da Caparica, Portugal, 25 MHz, QSO w/ HK0NA (Malpelo Island). 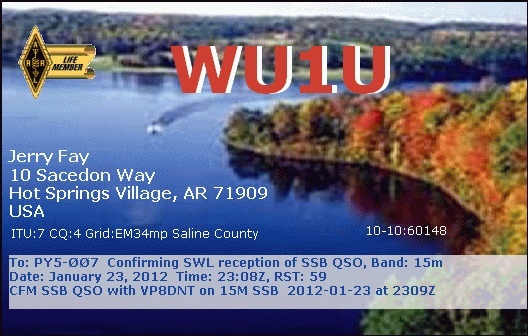 eQSL recebido: WU1U, Hot Springs Village, AR, United States, 21 MHz, QSO w/ VP8DNT (Falkland Islands). 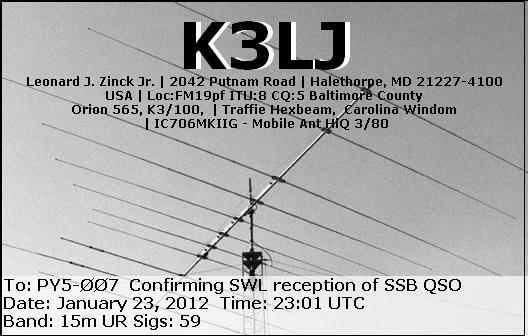 eQSL recebido: K3LJ, Halethorpe, MD, United States, 21 MHz, QSO w/ VP8DNT (Falkland Islands). 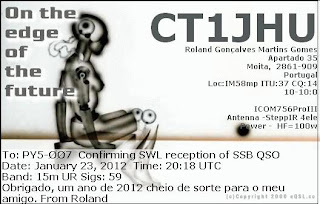 eQSL recebido: CT1JHU, Moita, Portugal, 21 MHz, QSO w/ HK0NA (Malpelo Island). 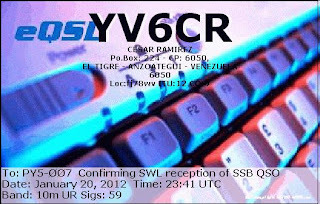 eQSL recebido: YV6CR, El Tigre, Venezuela, 28 MHz, QSO w/ PU2SDX, PP5JAK. 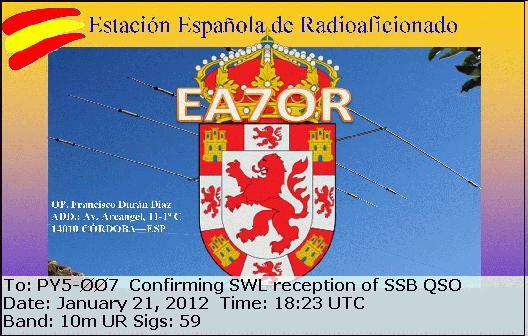 eQSL recebido: EA7HNI, Malaga, Spain, 14 MHz, QSO w/ HK0NA (Malpelo Island). 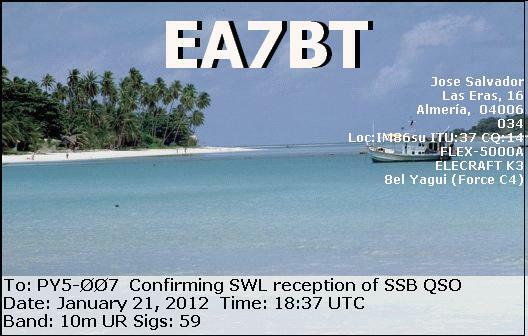 eQSL recebido: EA7BT, Almería, Spain, 28 MHz, QSO w/ HK0NA (Malpelo Island). 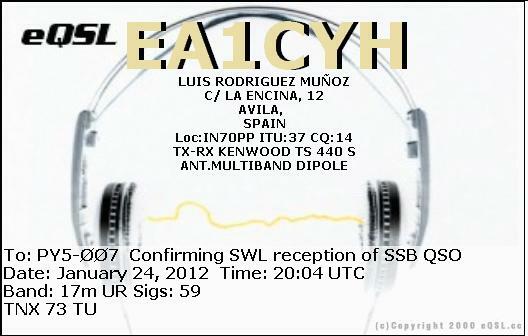 eQSL recebido: W4DKD, Gainesville, GA, United States, 14 MHz, QSO w/ PY7XC. eQSL recebido: EA7OR, Córdoba, Spain, 28 MHz, QSO w/ HK0NA (Malpelo Island). 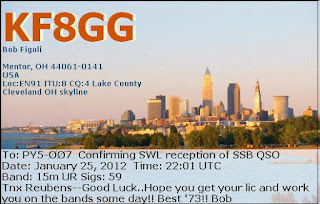 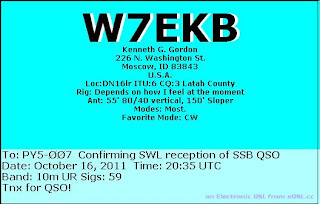 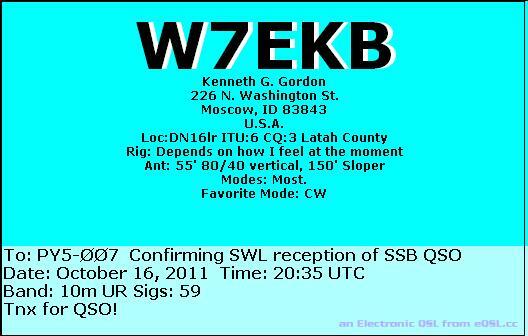 eQSL recebido: W7EKB, Moscow, ID, United States, 28 MHz, QSO w/ LW6DG. eQSL recebido: EA4FGB, Caceres, Spain, 28 MHz, QSO w/ LU7YS. 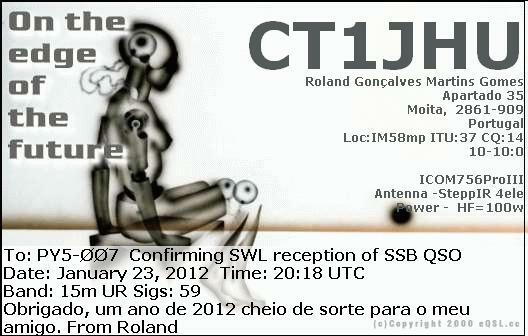 eQSL recebido: CT5GFE, Faro, Portugal, 28 MHz, QSO w/ EA1ALE. 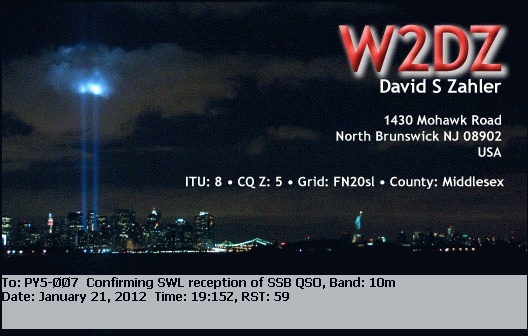 eQSL recebido: W2DZ, North Brunswick, NJ, United States, 28 MHz, QSO w/ VE5ZX. 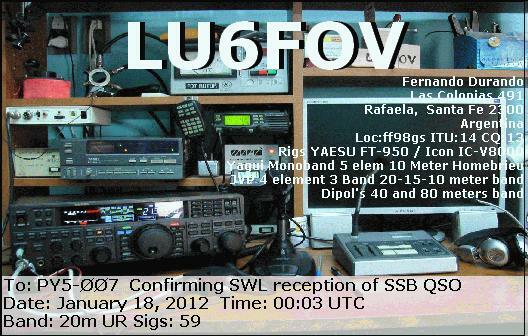 eQSL recebido: LU6FOV, Rafaela, Santa Fé, República Argentina, 14 MHz, QSO w/ HK0NA (Malpelo Island). 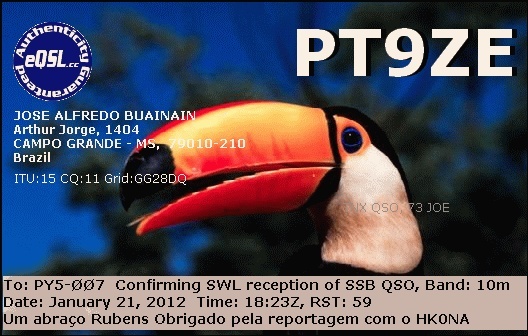 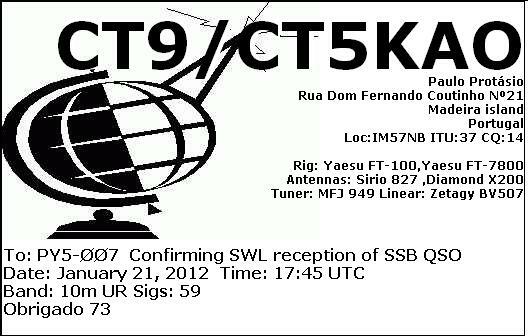 eQSL recebido: CT9/CT5KAO, Funchal, Madeira Island, 28 MHz, QSO w/ HK0NA (Malpelo Island). 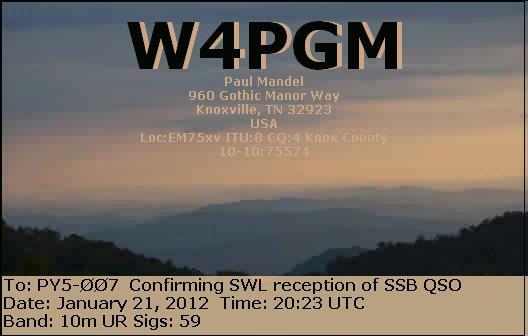 eQSL recebido: W4PGM, Knoxville, TN, United States, 28 MHz, QSO w/ VE5ZX. 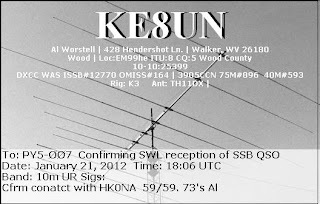 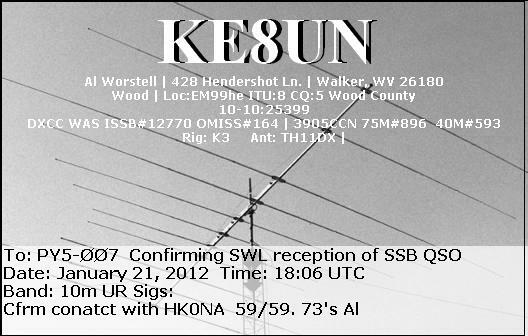 eQSL recebido: KE8UN, Walker, WV, United States, 28 MHz, QSO w/ HK0NA (Malpelo Island).